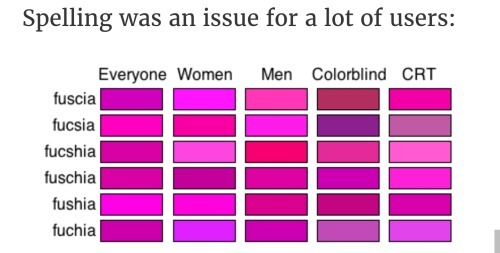 Did you ever see the xkcd colour survey? My entire family fought over the color of a car the entire time we owned it. Half the family said it was teal, the other half blue, and a few (shut up this is how math works!) weirdos said it was green. The manufacturer of the car said it was teal, which is a shade of green with a little blue in it, but damn I swear that car was blue with MAAAAAAAybe a tiny hint of green in it. This was probably 15-20 years ago and we’ll still all start fighting again if anyone brings it up with a quick it was tEAL!” in random conversations.